One of the big improvements over X370 boards that X470 models have introduced is improved power circuitry to better deal with AMD's Ryzen CPUs and to cater for the higher TDPs of certain new 2nd Gen Ryzen models such as the Ryzen 7 2700X. 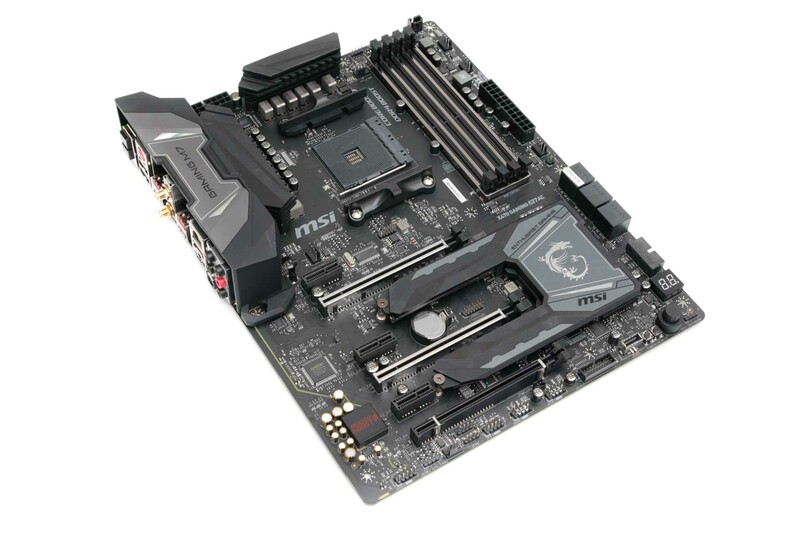 Nowhere is this more evident than the MSI X470 Gaming M7 AC, which in power circuitry terms appears to be an entirely different beast to its predecessor. It now sports an additional eight-pin EPS 12V CPU power connector and with 14+2 power phases it sports four more than the older board too. The heatsinks aren't quite as lavish as those on the Gigabyte's X470 Aorus Gaming 7 WiFi, nor are they connected by a heat pipe, but they're still fairly substantial. 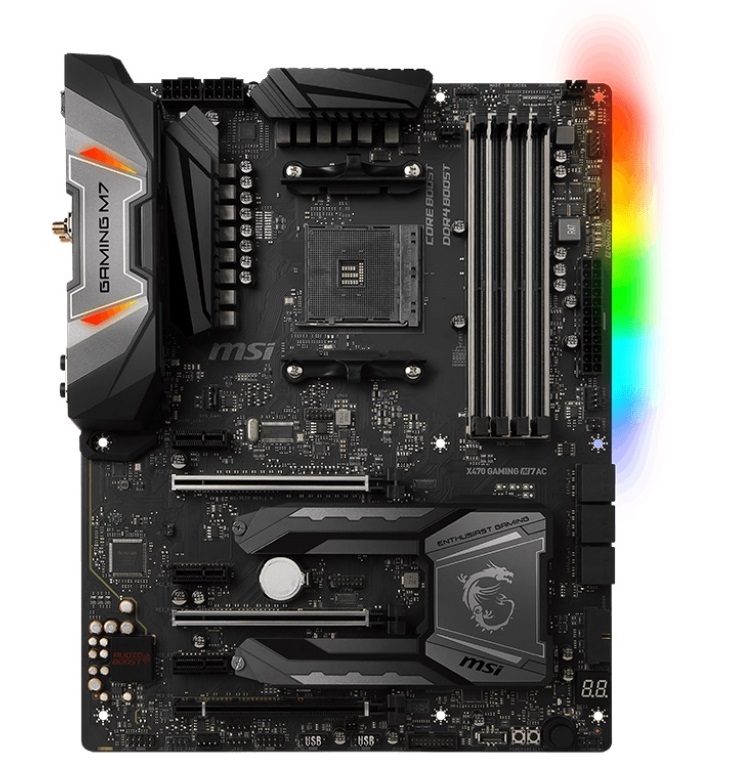 If you want to colour-match your board to your case and maybe make use of RGB lighting, then the X470 Gaming M7 AC is a good choice; there's barely a splash of colour anywhere, while the RGB lighting itself is fairly restrained, with two mirror-topped RGB lights above the I/O shield and a row of individually controlled LEDs down the underside of the right side of the board. You do of course get a smattering of RGB LED headers if your retinas aren't already begging for mercy with the onboard lighting. 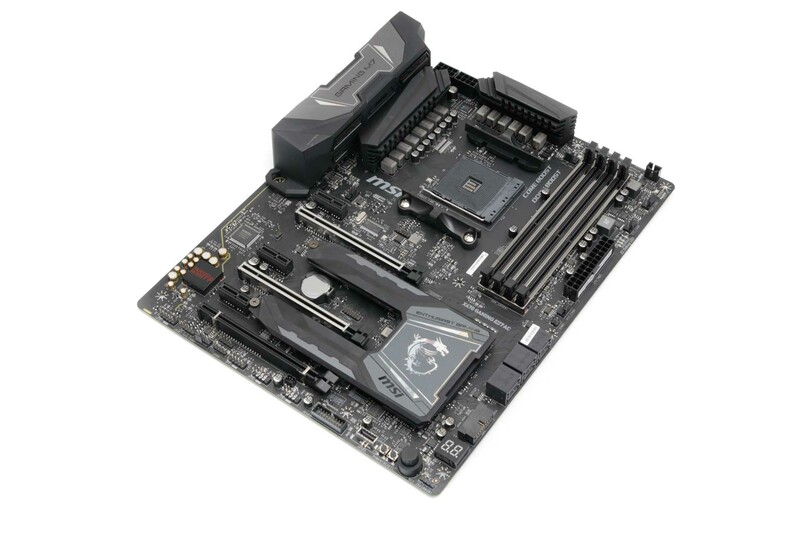 While Gigabyte includes dual-BIOS support, MSI matches its overclocking and testing tool feature set and throws in a reset button as well as a Game Boost knob, which can apply an overclock automatically, although with most 2nd Gen Ryzen CPUs reaching their maximum frequencies through boosting, this isn't a particularly useful feature now. There's plenty of modern connectivity, with ASMedia-powered USB 3.1 Gen 2 Type-A and Type-C ports on the rear panel plus a Type-C header on the PCB. You also get the standard six SATA 6Gbps ports. 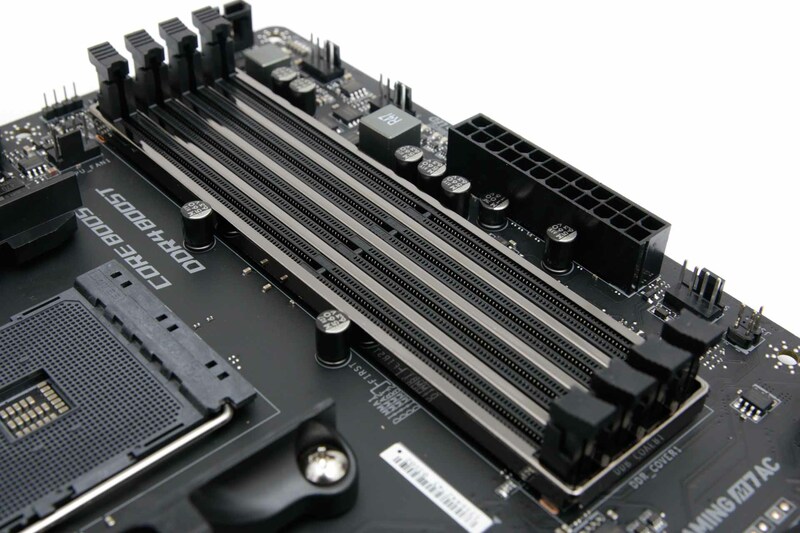 The X470 Gaming M7 AC's first trump card is its power circuitry, but the second is undoubtedly its M.2 heatsink. It's the biggest we've ever seen and straddles both M.2 ports. It had a huge impact on temperatures, with our Samsung 960 Evo SSD not topping 50°C, while the smaller heatsink on the Gigabyte's X470 Aorus Gaming 7 WiFi topped out at 59°C after our 10 minute load test. The downside to M.2 ports on X470, though, including here, is that so far the second slot appears to be limited not just to PCIe M.2 SSDs, but to PCIe 2.0 as well, cutting the read speed of our 960 Evo from over 3,000MB/sec to 1,600MB/sec. 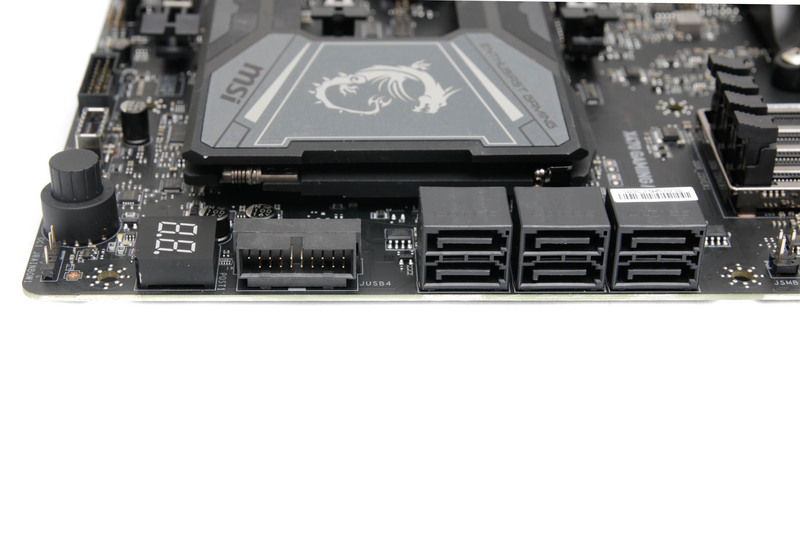 Only the top M.2 slot offers full PCIe 3.0 speed and support for SATA SSDs - in our mind it would be far more useful to allow the bottom slot to support SATA M.2 SSDs, as it's debatable how much use an M.2 slot limited to PCIe 2.0 is going to be given most PCIe M.2 SSDs are capable of read and write speeds well over 2,000MB/sec these days. Still, it's an issue with both boards we've tested so far, not just MSI. Another interesting inclusion is support for Corsair's lighting controller that comes with its RGB LED fan packs. 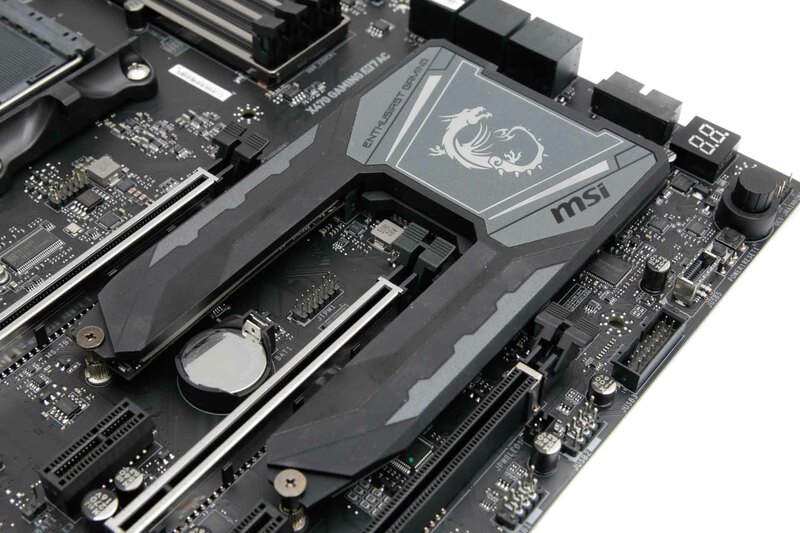 This can connect directly to a slot on the X470 Gaming M7 AC and MSI's software can control both the lighting and fans. This is clearly a nifty feature, although you can't control the fan speed and the X470 Gaming M7 AC only sports six fan headers compared to eight on the Gigabyte board. The rear panel offers a reasonable seven Type-A USB ports with four of these being USB 3.0, so unless you have several external hard disks and a plethora of USB devices, you shouldn't be left wanting. The rear panel also hosts a USB BIOS flashback button as well as a CMOS clear button, Wi-Fi antenna ports, and the full complement of audio outputs. It's worth noting that MSI has has opted for a Realtek-based NIC rather than Intel.